It was a night complete with art, live music, delicious food, and inclusivity. On Friday, March 1, dozens gathered for the opening of YAI Art’s new studio space. Everyone including art influencers, YAI artists, staff, and supporters were there to celebrate the new, inclusive art space. Music and dancing were in full force with the addition of live calypso. The YAI artists had prepared for the opening of their studio for over a month. The group was excited to not only show off their new space, but to present their artwork to the masses. Artist Jennifer, who’s know for her creative and fun cat paintings, explained, “It’s an accomplishment. It shows the world despite our disabilities we can do it with pride.” Other artwork displayed at the opening included Japanese animations by Brian, Luis’s favorite bands and television characters in artform, and Jimmy’s original cartoon-style characters. Jimmy printed one of his designs on t-shirts which had almost sold out by the end of the night. 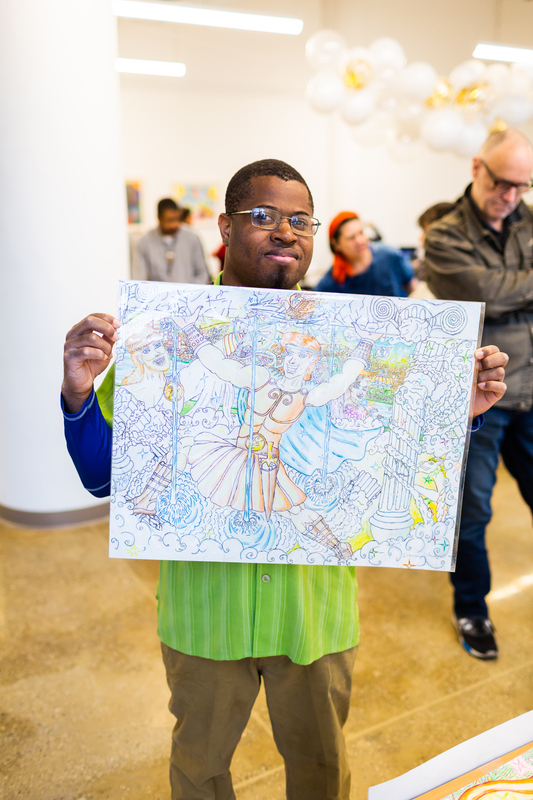 The YAI Arts program supports people with developmental or intellectual disabilities looking to build their creativity, display their talents, and get to know other artists within the community. Senior Supervisor of Community and Family Services Anna Schechter, who is an artist herself, heads up the program. If you’re interested in channeling your creativity and would like to learn more about arts and culture at YAI, please contact YAI’s LINK department at 212.273.6182 or link [at] yai.org.